Amazon.com description: Product Description: Contemporary Computer-Assisted Language Learning (Call) is a comprehensive, one-volume work written by leading international figures in the field focusing on a wide range of theoretical and methodological issues. It explains key terms and concepts, synthesizes the research literature and explores the implications of new and emerging technologies. The book includes chapters on key aspects for Call such as design, teacher education, evaluation, teaching online and testing, as well as new trends such as social media. The volume takes a broad look at Call and explores how a variety of theoretical approaches have emerged as influences including socio-cultural theory, constructivism and new literacy studies. A glossary of terms to support those new to Call as well as to allow those already engaged in the field to deepen their existing knowledge is also provided. 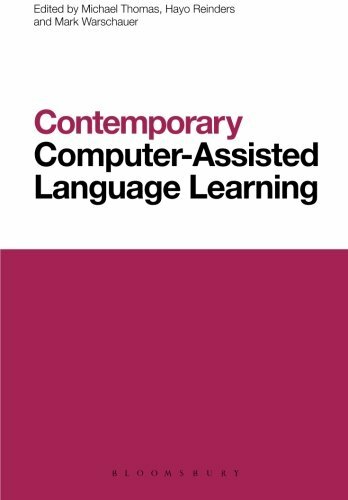 Contemporary Call is essential reading for postgraduate students of language teaching as well as researchers in related fields involved in the study of computer-assisted learning.